A ball penetrates through an examined cup. 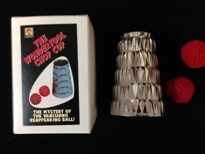 The ball is placed in the performer�s pocket, and magically reappears under the cup. This can be repeated a couple of times if you wish. It is once again replaced in the performer�s pocket, but this time when the cup is lifted a large ball of a different color. (or a lemon or onion) is found under the cup.